Firstly I would like to thank Musicteck for arranging the loan unit for review, after some discussion on the genres I listen to the Mentor v2 was suggested. These received the usual 50hrs of burn-in, no differences were noted. The packaging is really sleek and small, no wasted space which is good. You get a matte black card box, with Unique Melody written on the outside, on the side is a sticker with the model on it, and on the back it says “Hand Crafted With Love”. 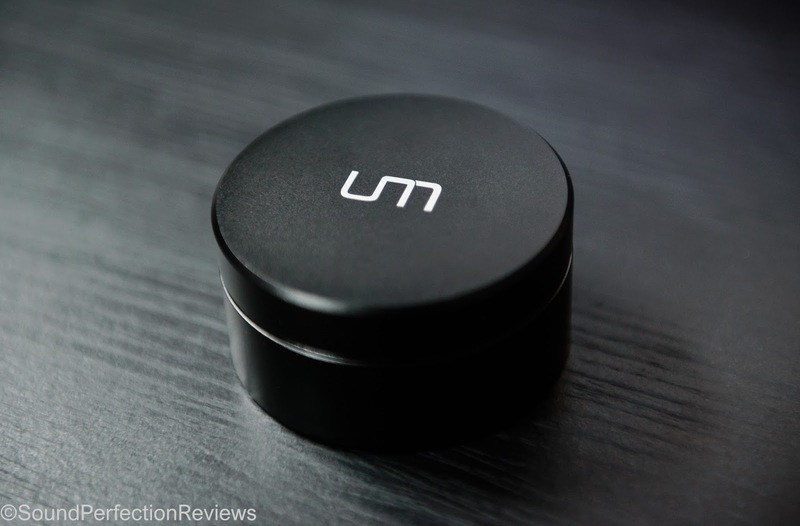 Out of this outer shell slides an inner box with a box of accessories and the circular metal case underneath. The IEM’s are held inside the case for transport. Again I like this no frill packaging, and it is quite normal for custom IEM’s to come in fairly plain packaging. 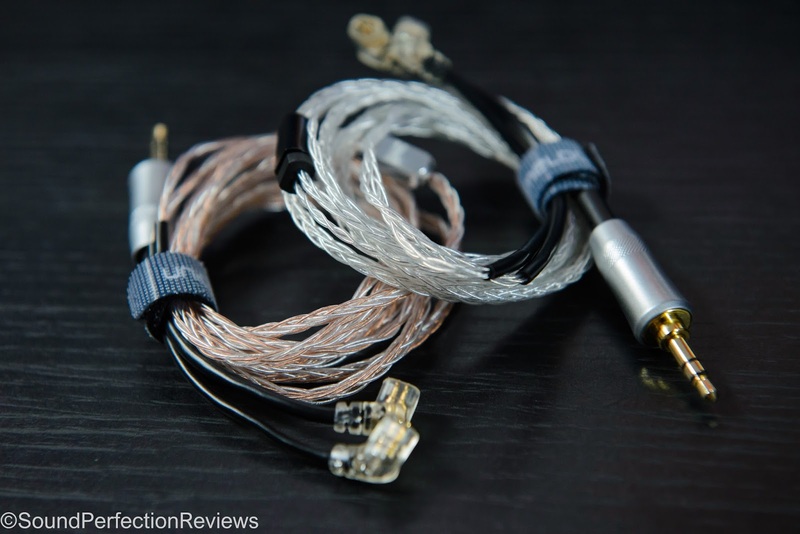 Build quality feels excellent, the housings are solid and so is the cable, with excellent strain relief on all areas except for the y-split. I really cannot fault the build quality in any area. Accessory wise you get single flange silicone tips in S, M, L and XL, foam tips in S, M, L and XL, jack adaptors (plane and 6.3mm), a cleaning tool and cloth, a soft carry pouch and the metal carry case (which is excellent and waterproof from the looks of it). 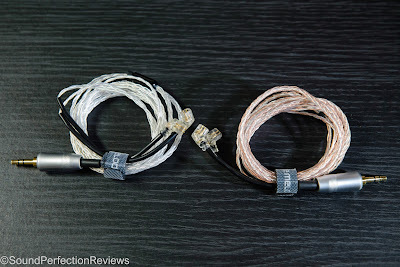 Also included were 2 cables, one is a hybrid copper/silver plated cable, the other is all silver plated. Overall plenty of accessories and an excellent package overall. Comfort is good, but I have very small canals, which meant even with the smallest tips they were still a little big. This would not be an issue with the full custom version. However the housing is well shaped to fit in your ear, all the angles are correct and once fitted they are comfortable. I am not a fan of memory wire on cables, but the memory wire on these really wasn’t an issue (however I would still prefer a cable without). So overall the fit is good, if not a little snug for people with abnormally small canals. 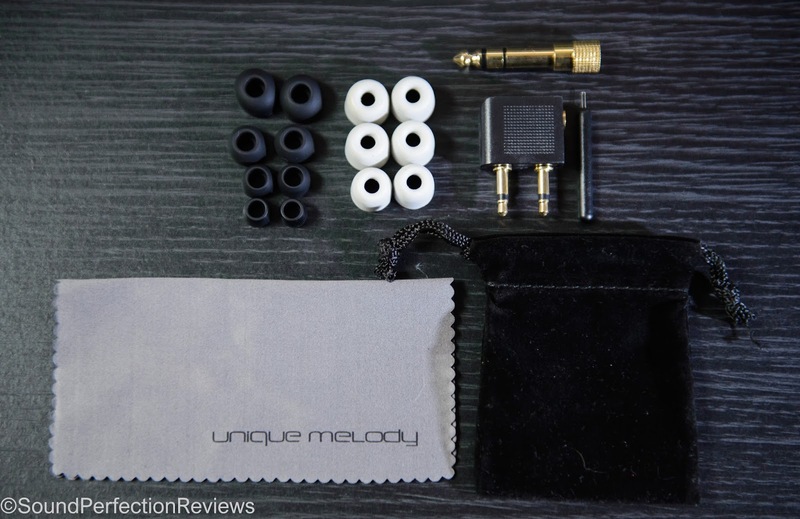 Isolation is excellent with the included foam tips, they seal extremely well, and are perfect for all use, including very noisy public transport and air plane journeys. Cable noise is noticeable as the cable is slightly stiff, but using the chin slider you can reduce it so that it is minimal and doesn’t affect your listening. Split in to the usual categories with a conclusion at the end. Lows: The lows on this are lightning fast but with realistic decay when called for. 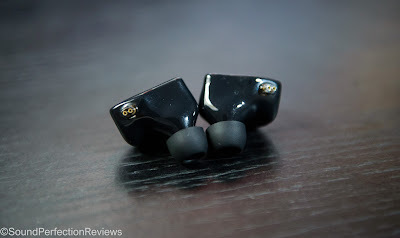 These are a lively sounding IEM, and the bass is really engaging but not dominating or in your face. The sub-bass is deep with excellent extension, but where these really excel is with rock music, the PRAT is really impressive, kick drums have a full kick and are easily distinguished from the bass line too. 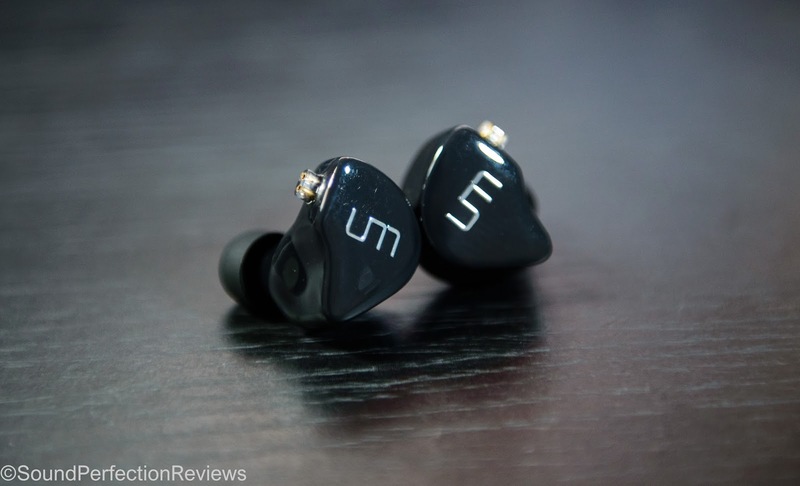 The 4 drivers do not delivery masses of over the top bass, what they deliver is perfectly timed kicks, and very easy to follow underlying beats, backing up the rest of the response. I found myself hearing fingers on the fret board of the bass during The Cure – Untitled (from Disintegration), hearing the strings vibrate. Compared to my InEarz P350’s the lows are much better separated and detailed, also better controlled. 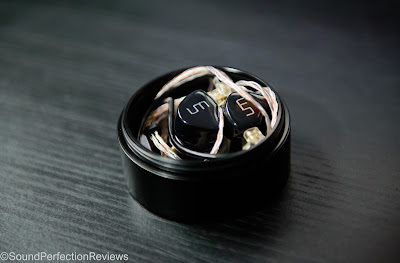 Mids: The mids are crystal clear, and perfectly balanced in the overall sound for my tastes, I would not class them as forward nor recessed. They give an insight in to the music, allowing you to hear every pick of a guitar, every breath a singer takes, all of this without sibilance. It truly is incredible the amount of detail you can extract when listening to these. These handle all kinds of vocals extracting the emotion and raw passion in a singers voice, guitars surround them with delicacy during acoustic tracks, and crushing power during heavier rock, never becoming muddy. Highs: Put it this way, it is easy to tell when you are listening to MP3’s on these, with the clarity up top on these, MP3’s sound muffled and compressed. Feed them a good quality recording and you will be rewarded with endless extension and sparkle, but these are also well balanced and controlled, even treble sensitive people would be able to enjoy these. I never feel the highs are lacking in quantity or quality, they are also never harsh or overly bright. Soundstage: The soundstage is very accurate, it may not be the widest but it is definitely wider than normal, height is also very good. What is most impressive is the pinpoint accuracy of each instrument. Instrument separation is also excellent, even during the fastest rock tracks everything is easily separated (if the recording is well mastered). 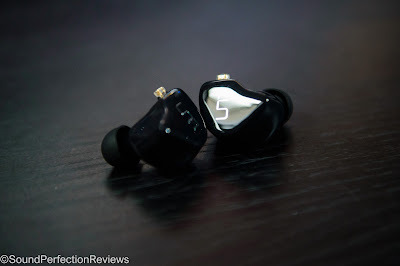 Conclusion (this is going to be longer than usual): Well I am very impressed with these, for one they are quite incredible from an engineering and technological point of view, but where they excel is musicality. They are crystal clear but far from boring, they are full bodied, in your face, engaging and overall very very fun to listen to. There are plenty of fun and excellent headphones out there, at various budgets, and the top end of the market distinguishes itself with the clarity and layering that the lower priced ones rarely match. Yes I am perfectly happy with my much cheaper customs, but they are no way near as detailed, nor do they have the layering these do. If I had the money, these would be on my short list, they have a well balanced sound, with fun factor, but also the delicacy to deliver emotion when called for. The visceral and quick lows, the crisp mids, the effortless highs all contribute to a well layered, and coherent sound, that you find yourself caring less about the gear and focusing on the music. Yes they do benefit from having a good source to power them, and also CD quality files, but they don’t render MP3’s unlistenable, they are slightly forgiving whilst staying detailed (contradictory I know). Value for money is up to the person looking to purchase these, I would say if I had the money, these would be on my short list, they allow you to analyse the music if you want to, but mainly they are for enjoying it. And for that reason they come highly recommended. 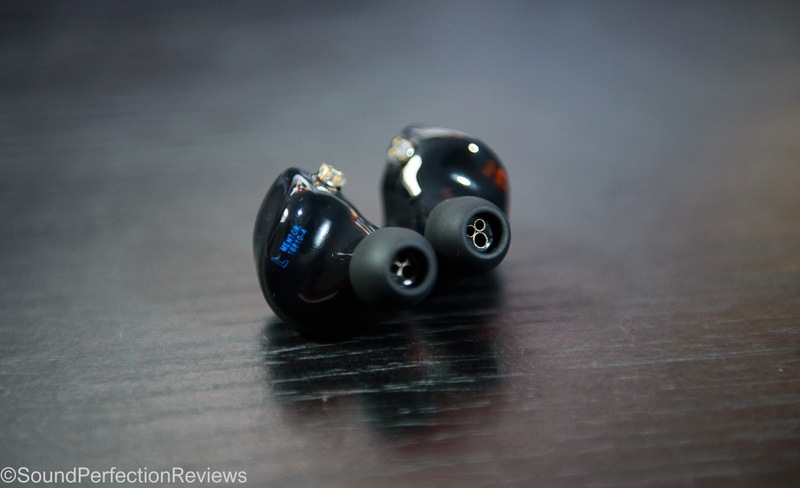 Welcome to Sound Perfection Reviews, a blog dedicated to audio equipment reviews. Run only by me, Oscar Stewart, I have a passion for good quality audio and I try to be as honest as possible in my reviews, portraying my subjective opinion. I hope you enjoy this blog and it helps you in your future decisions and purchases.